One of my favorite mobile invertebrates of all time is the Tuxedo Urchin (Mespilia globulus). Tuxedo Urchins are small sea urchins that have broad bands of color in between their spine rows. 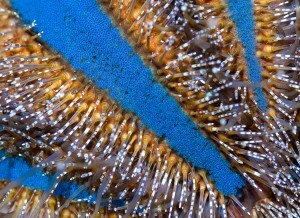 Most tuxedo urchins are blue or black and occasionally red. Their spines are short which is nice as there is less risk of you getting speared by a spine like with a long spine urchin. Besides small spines, tuxedo urchins don’t get big as their maximum size is about 3 inches (~8cm). Like most urchins, Tuxedos graze on algae. They are voracious eaters that will almost constantly cruise your tank eating any algae they can find. They’ll also climb on your glass and they’ll even clean up equipment (power heads, pump intakes, etc). Unlike other urchins, Tuxedos won’t bulldoze your rock work or coral although don’t be surprised if small frags or empty hermit crab shells become hitchhikers on the urchin’s back. Tuxedos use these items for camouflage against predators. While other mobile invertebrates like fromia or linckia starfish are very sensitive creatures that usually don’t fare well in aquariums, Tuxedo urchins are hardy and require minimal care as long as they have algae to eat. If your aquarium doesn’t have any algae for the Tuxedo to eat, you can hand feed the Tuxedo small pieces of sheet algae (nori) to satisfy their dietary needs. Just make sure you keep your fish away as the fish will often swipe the algae from the urchin before the urchin has a chance to ingest it! I have a pincushion and a long spine urchin, sea hare, hermits, snails and a serpent star and a decorator crab. The tank is always busy 24 hours a day. Sounds like a good idea. Do you think a 38G would be too small for an urchin? I also have a Pom Pom Crab, do you think there would be any problems? My Pom Pom Crab has a little bit of an attitude problem with my two hermit crabs. Gotta watch out about it sticking things on it’s back, I had a new expensive chalice frag that I put in the rack and was going to look at and admire when I noticed it wasn’t where I put it. Looking all over I noticed the plug on the urchin’s back! They end up depositing the plugs where you may not be able to get to them also. Other than that they are a good member of the clean up crew. Will the Tuxedo Urchin eat the Coraline algae off the rock as well? Are they safe with bubble tip sea anemones? Allen…yes. 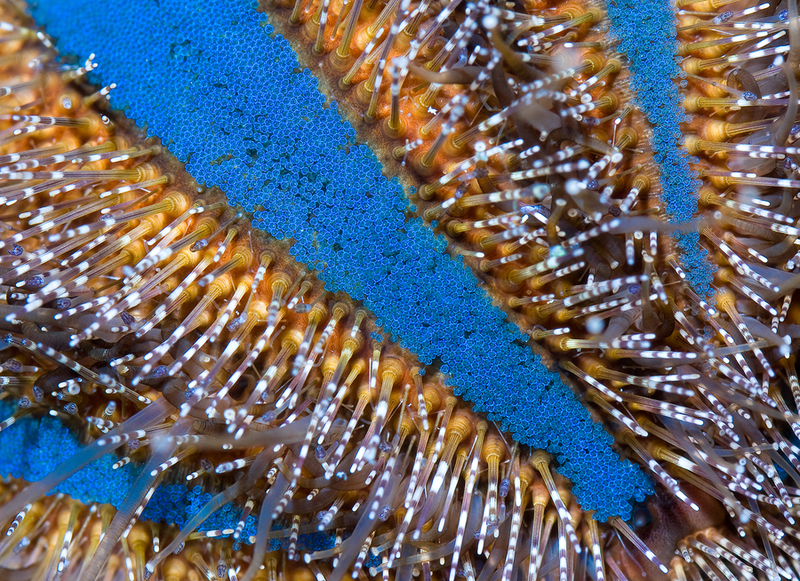 the bubble tip might sting the urchin if it gets to close and the urchin can simply retreat. Brian…tuxedos can remove coraline algae. Shawn…as long as there is food (algae) for the urchin, he will be fine. Is there a specific type of algae the urchin eats or does it feed like a buffet, litte (or a lot) of everything? Extremely useful info specifically the remaining phase :)I deal with such information a lot. I used to be seeking this certain information for a ong time. Thank youu and beszt of luck. Hi, my btu has hair algae growing from it or clinging on, not sure which, but will this be ok? I Am Going To have to visit again whenever my course load lets up – however I am getting your Rss feed so i could read your web blog offline. Cheers. SÃ³Å‚ jodowo-bromowa to Å›wietny pomysÅ‚. Do tej pory musiaÅ‚am jeÅºdziÄ‡ na basen, w ktÃ³rym byÅ‚a solanka, a z takÄ… solÄ… moÅ¼na zrobiÄ‡ sobie takÄ… kÄ…piel w domu.